>Well I feel remiss in not having posted in a while. Let’s see what’s been happening…..
As in the past the husband and I will be providing the deep fried turkey as part of the Thanksgiving dinner. This will go along with all the sides and the oven baked turkey Mom insists on having. And since we have all that oil bubbling, why not throw in some deep fried mushrooms and Pickles for a little appeateaser. So the other big deal is the Cruise has finally come. Saturday we fly on down to Fort Lauderdale to spend the night before we board the cruise ship Sunday morning. I am still trying to decide what I should wear for my TSA MANdated Pat Down. I guess I haven’t been following things too closely because I sure don’t know what the big deal is with these scanners. From FTL on Sunday we set sail for San Juan, Puerto Rico. Charlotte Amalie, St. Thomas, and Phillipsburg, St Maarten. This is a much needed, and much anticipated vacation, seeing as we booked WAY back in April. I will be sure to try and take some notes of stuff to post about upon my return. >So not so much has happened since Halloween around here. The temperature has gotten colder. The leaves have just about finished falling. We got our first bit of snow (albeit not very much and it was gone as the day progressed). Election day came and went with not much fanfare, though it took a while for us to finally get a Governor elect. The Drum Corps had an Open House this past week, along with that last Saturday found a bunch of us hanging posters around town trying to drum up interested (pun intended). Last night was our Friends monthly game night. We had a great time as usual. 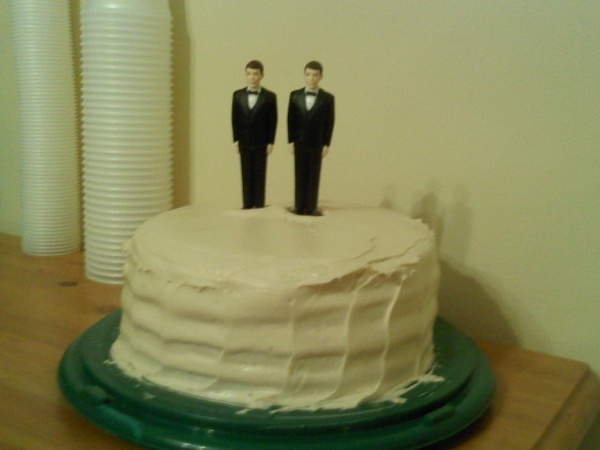 These are the friends who just recently got married so I volunteered to make dessert to bring. Really all I wanted to do was make them a Faux Wedding Cake since they didn’t really have one on the day of their wedding. 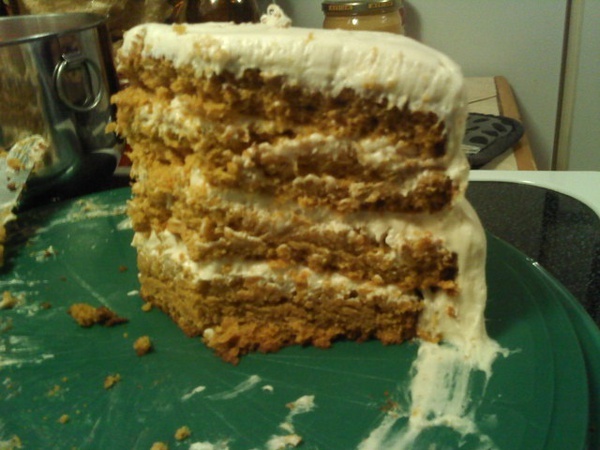 The cake was 4 Layer Pumpkin Cake from a recipe I found on Epicourious, with a Maple Cream Cheese frosting. The original recipe called for Orange cream cheese but I was in a maple mood. Here is the cake once it was cut and dished out. Not to toot my own horn but it was FABULOUS! So the biggest goings on of the week are actually the reason I haven’t blogged since Halloween. 2 weeks ago on a Wednesday I received a mystery meeting request at work the was CONFINDENTIAL. Naturally it was sent at 10 AM for a 4PM meeting. So I finally get to the meeting, and lo and behold – I and 3 others (who were not named at the meeting) were all being given a promotion, New Title, bit of a pay increase, and a small change in duties and the clients we deal with. So during the meeting they laid out the new role and what they would be taking away from me as far as miscellaneous things I do. They also made it clear this was confidential until the rest of my department was told and then the rest of the company. This didn’t happen until Monday/Tuesday. I am very excited about this change, as I feel they now will be using me to my fullest potential (something they have said for MONTHS they have not been doing). So that’s pretty much it. Welcome to November. Oh and 14 Days until our Cruise Vacation leaves. I CAN”T WAIT!